This vessel is in very good condition, all aluminum, lightweight, rubber coated bottom, twin engines, VHS radar, GPS system, trailer in good condition, engines run great, never been wrecked, ready for work. This vessel should last a very long time. Stock #122419 MOTIVATED SELLER, BRING ALL OFFERS Very nice 2004 All Aluminum Team Persuasion 26'! Great condition. If you are in the market for an utility, look no further than this 2004 Team Persuasion 26, just reduced to $45,000 (offers encouraged). 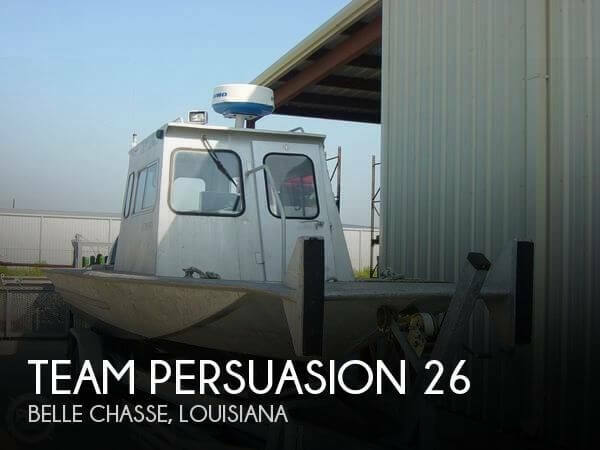 This boat is located in Belle Chasse, Louisiana and is in good condition. She is also equipped with twin Yamaha engines that have 710 hours. Reason for selling is not using any more. were used for marsh jobs..